Egyptian state news agency MENA announced earlier Tuesday that 84-year-old ousted president Hosni Mubarak was “clinically dead,” but more recent reports indicate that Mubarak is alive but gravely ill and in a coma after suffering a heart attack and stroke. 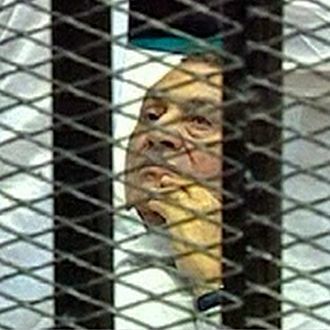 Mubarak has since been moved from prison to a military hospital in a suburb of Cairo. After 30 years in power, a judge banished Mubarak to life in prison on June 2 on charges of complicity in the killing of protesters during last year’s Arab Spring. The judge described Mubarak’s rule as “the blackness of a chilly winter’s night” as the former leader lay in a hospital bed during the proceedings. Egyptian unrest continues as protesters gathered in Tahrir Square again on Wednesday “hoping to reignite the revolution.” The results from the nation’s first presidential election in which Muslim Brotherhood candidate Mohammed Morsi faced off against Mubarak’s former prime minister, Ahmed Safik, are supposed to be announced later this week.